DOLE Accredited STO, Consultancy and HEO Testing Org. 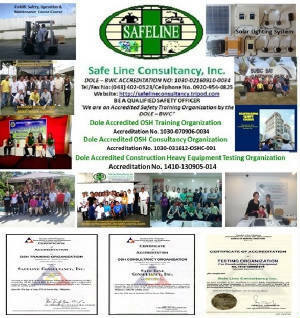 Safe Line Consultancy, Inc. (Safeline) was incorporated last November 8, 2002 and registered with the Securities and Exchange Commission with SEC Reg. No. CS200259652. Safeline is also registered with the Bureau of Internal Revenue with TIN 006-021-564NV. The company is an accredited Safety Training Organization (STO) by the Bureau of Working Conditions – Department of Labor and Employment (BWC-DOLE) with Accreditation No. 1030-070906-0034. Safeline Consultancy, Inc. is a founding member of (ASHTOP) Association of Safety Traning Organization of the Philippines under the auspices of BWC-DOLE. Picking the right consulting company can be challenging. You want a company that has experience, industry knowledge, and, of course, innovative ideas. Our company has the background and knowledge to help you or your company succeed. This site will provide in-depth information about our background and describe the different services we offer. We'll also include information about some of our top consultants. Please get in touch for more information and to join our mailing list. We look forward to working with you.